Dimension of each pan: 13"*10.5"*4"
Please wash the pan before the first using. Prohibit burning heater without water and make sure water goes over the Heating Element. Use thread seal tape to wrap the water outlet before tighten the faucet, otherwise it will not stand vertically and uprightly. It will also make it well sealed. Six 1/2 Size Pans&Lids Included. Wooden crate package. Please dont power on without water covered. View More In Food Warmers. If you have any questions about this product by Kitchen Supply, contact us by completing and submitting the form below. If you are looking for a specif part number, please include it with your message. 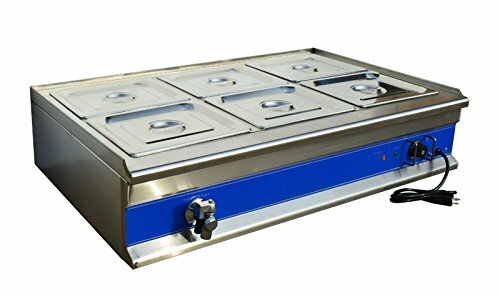 Commercial 110V Countertop Food Warmer Display Case w/ Water Tray 29"x20"x27"